I have to admit I spent ages trying to get the right photo of this here tree. I have visited it on several occassions over the years and finally I got what I wanted. You see, what I always wanted to capture on film was the likeness to a snarly old crocodile leaping out of the marshland. I think I have finally managed to satisfy my desire. I have always looked at this tree and for some reason it reminds me of the jaws of some crazed prehistoric animal, I’ve never been able to get the right angle on the camera compared to what the naked eye can see. I finally gave in and spent ages setting up the tripod on a small hill opposite, it was a rather precarious situation featuring lots of heavy bricks and painful body positions. The torture people go to for their art, eh ! To me, the tree looks like it is actually rising up from the ground, almost like a scene from some old cult horror movie, you know the scenario – “They thought the tree was dead but it rose up from the ground and devoured unsuspecting people in the park”. It also looks like the tree trunk has physically eaten away most of the metal fence surrounding it in a real show of defiance. I always fear the day that I go back to this part of the Furry Glen and finally discover that the park rangers have remembered to take the trunk away, it’s been there in this exact spot for many years now and it’s pretty obvious it didn’t just fall down on its own. I wonder did somebody place it there specifically for nerdy photographers like me to spot and think they have stumbled upon something totally unique. There are probably a gang of mischievous park rangers hidden from view watching this spot all day just waiting to have a laugh at my expense. Well lads, if you’re reading this you can take it away now, I don’t want anybody else coming along and copying my antics. 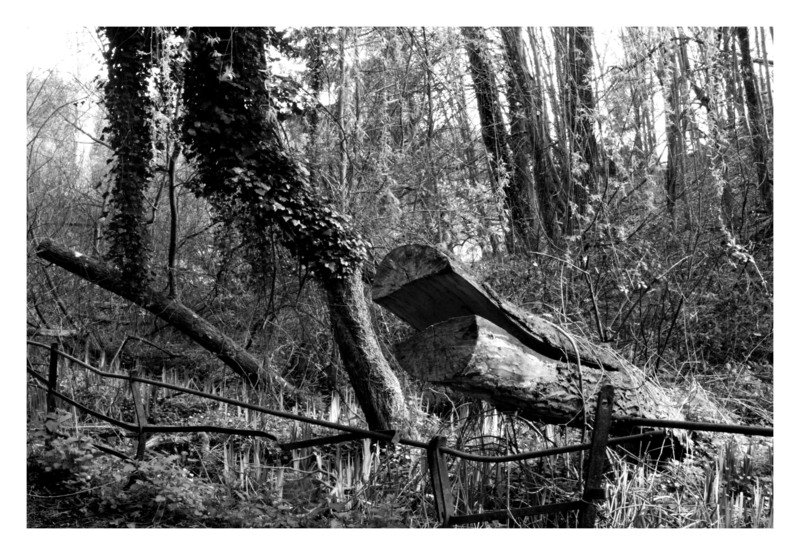 This entry was posted in Black and White Photography, Irish Landscapes, Phoenix Park and tagged Black and White, Furry Glen, Phoenix Park, Photography, Wide Angle. Bookmark the permalink. Thanks Gib, you ever want one for a sleeve just holler, obviously it would be free to your good self.